Nagging is the reported #1 marriage killer? Really? This statement concerns and disturbs this marriage expert. I disagree with the label inferring nagging kills! Nagging in and of itself is not the marital killer in my professional opinion. Rather, one of the biggest problems in marriages that can destroy a marriage is the extremely common marital communication challenge and cycle which is a communication relational dynamic between husband and wife that is a circular pattern which leads both the “requester” (I prefer this term over nagger) and the “requestee” feeling disrespected, unheard, and not appreciated. If you blame the “nagger” for killing the marriage then you are blaming the wife, as the wife is typically labeled the nagger. An article written in the Wall Street Journal entitled: ‘Meet The Marriage Killer’ has led to marked media discussion this past week. Who better to share cutting edge insights, tell you like it is, offer theories, and concrete solution resolution techniques but this marriage expert! If you wish to view my interview on FOX & Friends Weekend where I appeared as the guest marriage expert where Alisyn Camerota, Dave Briggs, and Clayton Morris and I had a lively and informative discussion about this interesting topic, click the play button on the picture below. This interview took place live in studio on Sunday 1/29/2012. In addition, beneath this video for on demand viewing, you also will find in written form my theory and strategies in summary, which were discussed during this interview. Women are typically termed the nagger since they are often asking and re-asking. What they are doing is trying to manage the business of ‘home’. A successful manager is able to give tasks to their “employees”. The problem is that this role women have in a marriage as manager, men do not want to be the employee nor be managed, so the position of manager is not successful because the position of employee is not the accepted job position. If rather husband and wife both see their marriage as a whole and the interaction communication dynamic between them as all a part of their marital partnership in their business of life, then they can each play a role in helping their marriage not only to not be destroyed by a negative communication cycle, but rather move beyond a marriage that simply survives and rather thrives. Acknowledgement and Both Take Ownership (A.B.O. )- Acknowledgement between both spouses that the marital communication relational dynamic is the problem and both the husband and the wife must both take ownership each day of what they can do to have a healthier communication style- is key. Acknowledging there is a team problem is the first step towards solution as a team. Operation Appreciation Technique- AM: Tell your self and your spouse what you appreciate about the other each morning before you start your day. PM: Remind your self and your spouse what you appreciate about them before you go to sleep. I Do for You and Us Technique (Y.U. )– Daily mindful awareness of your spouse’s needs (this goes both ways) and the couple’s needs. Make it a point each day to take action and actively do something for your spouse and for the couple that is something your spouse will appreciate and the couple as a whole will appreciate. If you are lacking in awareness ask. This is part of being a marital team- doing for one another and for the couple. Texts and Emails- The utilization of technology for requests in list form are helpful as it takes the emotional interactional dynamic out of the exchange. Use this on occasion as needed to help in addition to, not instead of the aforementioned methods. When you __________ (don’t do what I ask), it makes me feel ______ (unheard). When I feel ______ (unheard), it makes me want to _______ (tell you louder what I want you to do). Instead I will __________ (say out loud that I love you, appreciate and value all that you do and ask if we can continue to be a great team together). When you _________ (ask me to do something), it makes me feel _________ (like you are constantly telling me what to do and I can never do enough). When I feel _____________ (like you are constantly telling me what to do and I can never do enough), it makes me want to ________ (zone out). Instead I will _______ (say out loud that I love you, appreciate all that you do and do my best to take care of what our team needs because that is part of being a good provider). Note to my readers: I hope you find this video and blog helpful as it is my desire to offer insight and education to help promote the growth of marriages. 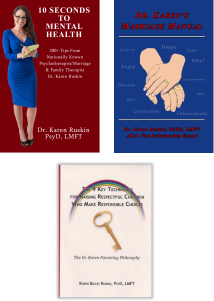 If you wish to learn more marital strategies for a lasting healthy marriage, check out my newest book release as seen on FOX & Friends and FOX 25 News Boston; ‘Dr. Karen’s Marriage Manual’– available for purchase. Previous post: Demi Moore’s Hospitalization: Exhaustion a Real Diagnosis?